In depth: Too old and fat for trackdays? Never go over old ground, my dad used to tell me when he could still string a sentence together. Girlfriends, places of employment, even cars. Re-visiting history will only end in tears. They are, as twatty ‘life coaches’ insist, words to live by. Since packing in motorbikes at the end of 2007 – save for the odd paddock scooter, 15 miles on a Panigale and an ill-advised trip to the Isle of Man to ride dirtbikes with Jonathan Rea – it hadn’t crossed my mind to ride again properly for various reasons. The last foray was a three-day December Cartagena extravaganza on my brother’s 2004 CBR600 which was cut short by a huge round of apathy on my part. I had two good days, set a good-for-me 1’48s laptime (Leon Haslam’s Superbike record is some 17s faster) but woke up on day three and couldn’t be arsed. And that feeling has stayed with me. My brain set itself in a mode that I didn’t need to do it any more. I had been riding since I was a small boy, never crashed on the road, only crashed three times on track so there was no sense in pushing my luck. Job done. Then someone at BMW double dared me to go on their first-ever owners’ track day. A single dare you can simply treat with the contempt it deserves and wave it away with a quiet ‘pah’. A double dare is something different again. All of my excuses for not doing it appeared during a game of a email tennis: I don’t have any leathers (lie), I don’t have a helmet (lie), my dog ate it, I left it on the bus… none did the trick, so I found myself at Donington Park for the inaugural BMW Owners’ Trackday on a bright August morning, with shakes enough for a whole room of cold turkey meth addicts. 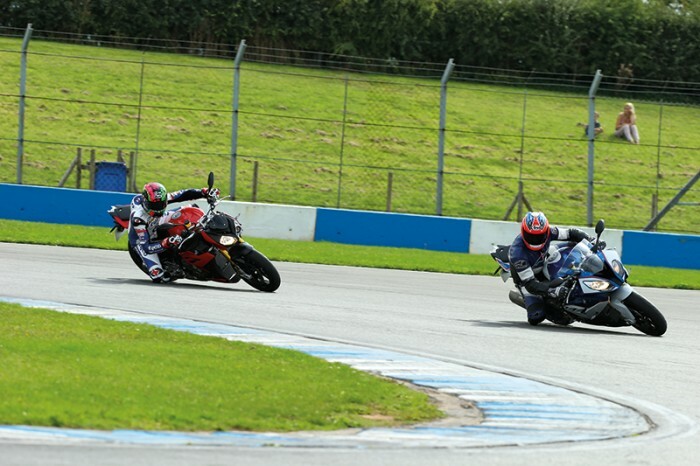 Now, I like Donington Park. Actually, I like most of Donington Park. I don’t like Craner Curves. I have been around racing and riding on track to know there are those people who have crashed at Craner and those who are going to crash at Craner. Making the jump from the latter to the former appeals to me not one bit. I have the entirely-normal fear of hurting myself that every single racer in the world doesn’t have. This enables them to pass through Craner, on a BSB bike at least, approaching 160mph. BMW had a selection of their wares lined up outside garage one, so on the slow group sighting laps, I snaffled a S1000R, non-faired thing. The last litre bike I rode was an R1 during the Year 2000 Performance Bikes Dangerous Riding Contest at Circuit Pau in France, where I was joined by the likes of Scott Smart, Gus Scott, Ronnie Smith plus colleagues like Lord Trevor Franklin. In those days, big sportsbikes pushed out 148-odd horses. The S1000R doesn’t have a fairing and has 160bhp. And so I managed not to stall, rolled down pitlane with my heart doing a really good impersonation of the chest burster that made its way out of John Hurt in Alien. And watched in horror as every single one of the people in front of me, got smaller and smaller, not bigger and bigger, as I had hoped. This was not good. Still nervous and now entirely downcast, I headed for another nervous piss before deciding the S1000RR was the way forward and taking out the 200bhp sportsbike. Michael Laverty who, with Tyco BMW team-mate Tommy Bridewell, was on hand to offer advice said to me that the S1000RR changes direction really fast, so it might come as a surprise. Thanks for that. And there was an epiphany. This thing, which has 50 more horsepower than the last litre bike I rode, is so easy to manage. Yes by Christ it is fast but it’s not scary fast in the way the original R1 was. The clocks don’t smash you in the face at the first idea of throttle introduction, for example. It goes where you tell it to go – which is not necessarily where you want it to go but that is down to you – you can brake as hard as you like to find you could have started braking much later and it doesn’t do anything remotely off-putting, even with a rusty old twonk like myself at the helm. Gradually, some confidence appeared. Before my follow-me lap with Laverty (see separate box), I made my way past most of the bikes that had previously sodded off into the distance and with some ease. And the opening sessions’ in-helmet mantra of ‘please-don’t-crash’ for 2.25-miles had almost left me. It was still there, along with not breathing and clenching of arse through Craner, but that I don’t think will ever go away as I like all my limbs attached and pointing in the correct direction. “You’re not bad overall for someone who hasn’t ridden in a long time. The first point you need to improve on is corner entry. You do what a lot of guys I see do, especially when I am instructing, and that is ride the whole circumference of the corner. These bikes now, particularly with tyre development over the last ten years, allow you do get to more of a point and fire it out. You are slowing up, putting the bike on its side and picking up speed on the side of the tyre, hanging out too long, do all your stopping and then sweep in carrying too much speed. But your straight-line braking in the second half of the lap is pretty good. “If you trusted the front a little more, go from upright to the apex and keeping the front brake on, scrubbing speed that way to the slowest point and then using the power to get out. It’s a case of learning to use the feeling from both ends as you go in and out. At the moment, you keep a neutral bike, do all your stopping and then throw it on its side loading both wheels together. That is the safest way to do it but it’s not the fastest. That is where you would find big chunks of time. You would probably be better off going a bit slower, find your confidence to do it and then pick the speed back up. “Linking corners together is another area. I can see you are pretty tentative through Craner and staying to the left - which sets you up nicely for the Old Hairpin - but you would lose a lot of ground and you need to be on the gas all the way down and use all the track. “You sit a bit too rigid on the bike. You should be throwing your body at the corner as you approach, leading with your shoulder and elbow, helping the bike turn. Currently, you are too central and nervous with it. Move your weight to the outside and really get your knee digging in to the ground so you will know more where the bike is at.